TerraCycle To Recycle Chip Packaging Into Bags - And You Can Win One! TerraCycle To Recycle Chip Packaging Into Bags – And You Can Win One! This giveaway has ended. I have written about TerraCycle a few times in the past because I truly believe in what these guys are doing – taking our trash and making them into usable products that are affordable for everyone. At the same time, consumers and local community groups can earn money by collecting the used packaging for TerraCycle, while keeping packaging from landfills. It’s truly a win-win for everyone involved, and their next project will just reinforce this fact. TerraCycle and Frito-Lay have formed a partnership that will take used packaging and turn them into affordable goods. The company is asking buyers to form “Chip Bag Brigades”, and for every bag a brigade collects and sends to TerraCycle, Frito-Lay will donate two cents to their charity of choice. Initially, there will be 1,000 collection sites and more are expected to be added during the year. The goal of the program is to engage at least 150,000 people and divert more than 5 million bags from landfills. 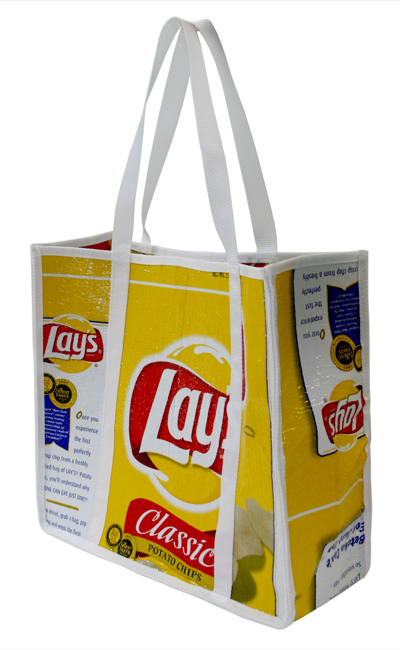 These tote bags made from 20-30 used chip bags Frito-Lay waste packaging will not be available for sale until the Fall/Winter 2009 – but you can win one today here at The Good Human. We are the first site to give away one of these not-yet-released bags! How can you enter to win this bag? Well, it’s pretty easy… There will be a code word or phrase inside the RSS or email subscriptions (towards the bottom) that get sent out each morning to every subscriber of the site. Not subscribed yet? Make sure you are so you can have a chance to win the tote bag! You will need to email me that word or phrase in order to be entered to win the bag. You can email me directly if you already know my email address (which some of you do) or you can use this contact form. The contest is open to US residents only, and TerraCycle will be shipping the tote bag directly to you. From all entries that are received, I will use a random number generator to choose a winner, and will contact them by email. Giveaway ends Thursday May 21 (my birthday, coincidentally) at 12 noon MST, and no more entries will be accepted after that time. Good luck to everyone, and thanks to TerraCycle for offering this tote bag as a prize before it’s available to the public! This giveaway has ended.